♥ Does My Bunny Talk? ♥ How do you talk to your bunny? ♥ Is there a right way to pick up and lift your bunny? Well, not really talk with words, but bunnies have a wide range of sounds and actions that communicate what they want. You can tell what your bunny is trying to say most of the time, if you pay attention. Bunnies not only talk with a range of sounds, but they also talk with their ears and with their body posture. A rapid, soft chattering or clicking sound from the teeth is referred to as "Purring". A bunny might do this as a sign of extreme happiness most often during petting. Your bunny loves to be cuddled and petted. Grinding Teeth is a louder and slower sound than "purring". The grinding sounds are usually farther apart and often accompanied by other signs of discomfort, distress or nervousness. Yes, your bunny can grunt and/or growl. Grunts and Growls have various meanings. It could be your bunny's way of telling you to leave it alone! 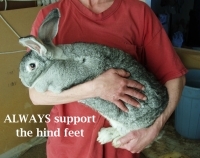 This sound is often accompanied with lunging when the bunny is "protecting" his/her home or hutch. A pregnant bunny may grunt and growl when you try to pick her up if she is close enough to labor where picking up is just too stressful for her. Bunny's will often grunt and/or growl if you attempt to clean their hutch without removing them. Bunny's are VERY protective of their homes, so, if you have a bunny that grunts, growls, and/or lunges at you during cleaning, remove your bunny from the hutch before attempting to clean. 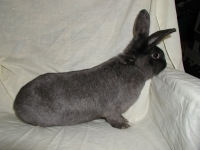 Soft snorting sounds are often made by female bunnies ready to mate, though fixed bunnies have been known to make them also. This is part of the mating ritual where the female is inviting the male to show her attention. This sound is never used aggressively. Rapid high pitched squeaks are a sign of anxiety, fear, and/or nervousness and may be accompanied by frantic running around the cage, or cowering in a corner. If your bunny is doing this, speak gently, quietly, and move slowing away to help lower his/her anxiety. I’m sure you've heard the phrase "die of fright". A bunny can literally die of fright, so go slow, keep calm, and don’t let your friend become overly agitated. Leave for awhile if necessary until the bunny calms down. A sign of extreme fear and/or pain is a scream. This scream sounds very much like a woman's scream. Loud, short and high pitched. (You might also hear this sound in a very sick bunny shortly before they expire). Shortly after rescuing a young female, she was put out in the playpen for a run. When I went out to get her, she was hiding in some very tall grass. Even though I spoke to her before approaching her, as soon as my hands closed around her she screamed. I think she believed she had been "caught" by an eagle or some bird of prey. It took much cuddling and loving to calm both of us down. Yes, bunnies do thump like "Thumper" in Bambi. A bunny will thump (slap the ground very hard with their hind foot) when they sense or hear something that they are unfamiliar with. This is a very quick hard stroke. It is a sign to other bunnies to be aware and take cover. Sometimes, in the Rabbit Rescue, one bunny will start thumping because they know someone is in the room, but that person is not doing their "normal" activities such as cleaning or feeding. One thumping bunny will turn into two thumping bunnies, until all of them are thumping. As mentioned in a previous article, your bunny has many ways of communicating with you. They do this through sounds as well as actions. Here are a few ways to help you figure out what your bunny is saying to you with body language. A sign of attention, curiosity, and playfulness is "Both Ears Straight Up". This is your bunny saying "Did you hear that? ", "Did you see that? ", "Are you watching me, I'm about to get up to dickens....." or "wow"! Talk about a bunny "getting up to dickens..." here's Good Friday. He's always into something, and always curious about everything. Ears flat against the head could mean resting, anger, or shyness. Look at the rest of the bunny's attitude to determine which it is. * If your bunny is lying down, spread out, it means he/she is resting or content. * If your bunny is lunging or grunting with the ears back, it means anger or "leave me alone". * Ears flat, grunting, head and chin near the ground and rear in the air is an invitation for mating. * If your bunny is sitting in the back of the hutch (in a corner) with his/her ears back and ducks away from you when you reach into the hutch, this could be signs of a shy bunny. * If the ears are back and your bunny is facing a back corner of the hutch, your bunny may not be feeling well. Note if your bunny eats or drinks anything. Offer them their favorite food or treat. If they ignore it, don't wait, start treatment for any one of the problems that could ail bunnies. If your bunny has one ear forward and one back, this is a sign of semi-attention. Something caught his/her attention, but he/she is not fully interested yet. A light nip from your bunny could be their way of telling you to stop doing whatever it is you are doing, or it could be their way of saying you are not paying enough attention to them. A harder nip could mean that you hurt him/her or that he/she is not feeling well and wants to be left alone. However, male bunnies will nip and bit when mating. It's not uncommon for an active male to attempt to mount his human care taker and the nips and bits would be part of the ritual. Once again, you need to take into consideration the current circumstances that lead up to the nipping. Bunnies mark their territory by rubbing their chin on everything including you. Feel honored if your bunny "chins" you because he/she is happy with you and is making you "theirs". This is a sign of ownership and affection. Another sign of affection and contentment is licking and nose rubbing. 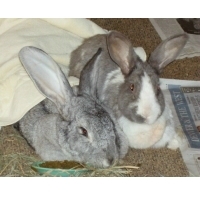 Rabbits use these activities to display friendship with each other, and will extend that to their human friends as well. Note, however, that licking could also mean your bunny is licking the salt from your skin, or it could be their way of "cleaning" you. We have some rescued rabbits that have what we call a "Licky Motor". When you scratch a certain part on their back, they lick like crazy. When you stop scratching, they stop licking. A bunny will nudge or bump you (or their bunny friends) to either ask you to move, or tell you they need more attention. If you are spending time with your bunny on your lap and you stop petting them, they may nudge you to tell you to get on the ball and keep petting. A sign of utter relaxation is when your bunny is spread out flat on his or her side, legs stretched out, head down... Absolute bliss! Since a bunny is rather high on the normal natural food chain, they have to feel extremely safe and secure to allow themselves to achieve this type of position. 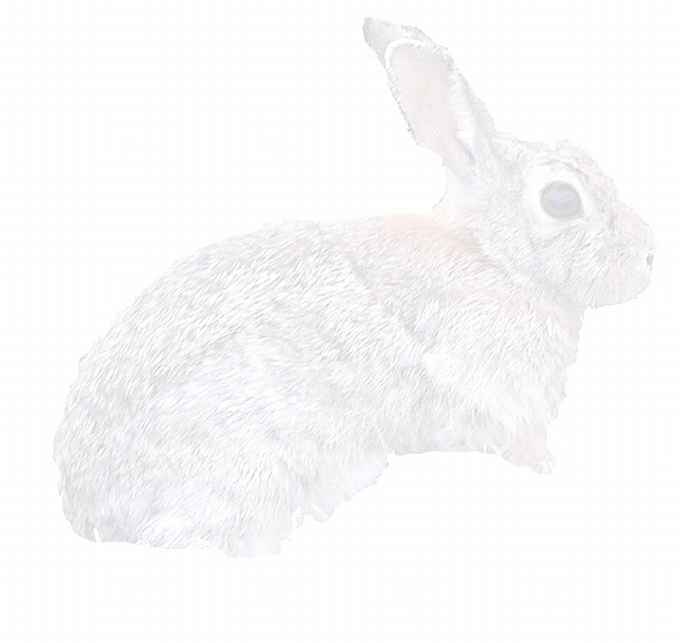 A bunny that does not feel safe and relaxed will generally assume a crouch (prepared to "take off") with the head up and ears swiveling to catch all sounds. If your bunny pulls away from you, backs away, runs to hide, grunts, or bats at you, they are generally telling you to leave them alone! If your bunny is sick and you are currently treating them, or you have a female that is protecting her young, then it is OK to leave them alone. However, if they do this when you are trying to bring them in from their exercise time, Don't let them get away with it. Talk to them quietly, walk, and move quietly and slowly towards them, or even get down to "their" level on your hands and knees to approach them. If they try to evade you at the end of "play time" and you let them get away with it, you will end up having lots of exercise yourself every play time just trying to bring them in. If they display grunting, batting, and/or nipping behavior while in their hutch and they are not sick or protecting their young, you should also not let them get away with it or you will never be able to take them out when necessary. Male and Female bunnies alike show dominance by either placing their head or paw over the ears of another bunny. You can not only display your dominance, but also calm your bunny by placing your hand over their ears and gently but firmly pushing them flat against your bunny's back. This should help stop the batting (and possibly nipping at you), though they may still grunt. If you can stop the batting and nipping, you should then be able to continue with whatever you needed to do within their hutch before the incident occurred. 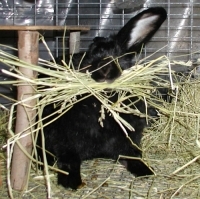 Does your female bunny gather bunches of hay in her mouth? Pull hair from her belly? She is nest building. Female rabbits will do this even if they are not pregnant. Scientists call this "false pregnancy". .Don't worry. It's natural. However, you may want to increase her papaya intake during this time to help prevent hair balls. Some female bunnies may never build a nest, others might do so all the time. I have one female that does this just about every month, and sometimes even twice a month. Meet Tar Baby, the perpetual nest builder! This is a nest built by Holly. When she is done building, she moves her stuffed toy into the nest because she does not have any babies to put in it. How do you talk to your bunny? Rabbits have a "pecking" order, which means, some rabbits are more dominant than others and will show it. One of the signs of dominance between rabbits is laying the head over the ears and neck of the less dominant rabbit. 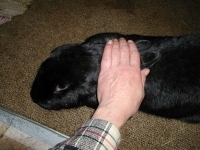 Rather than let your bunny get the upper hand, you can display your authority by laying your hand over the ears and pressing them down flat against the neck. This technique is used a lot in the rabbit rescue with one particular female that insists on trying to be aggressive during feeding time. When you reach into the hutch, she grunts, charges and bats with her paws. She learned to be aggressive prior to her rescue because she had to constantly battle to get her share of food. 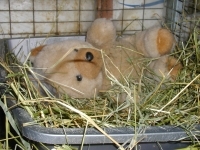 To resolve this situation, the care taker reaches in the hutch with one hand, presses her ears against her neck, at which point she crouches down and allows food to be put into her dish. Licking can be a sign of affection. Paired rabbits will lick each other's head and ears. You obviously cannot lick your bunny, but petting his nose, head and ears will show your affection for your furry friend. Bunnies may occasionally nip you either out of agitation or excitement. To show your bunny that this is not acceptable, exclaim "OW" loudly, which will startle bunny, then press her ears down to her neck with your hand to let her know you are the dominant one and you will not put up with nipping. Dominant bunnies will also nip a fellow bunny when it is doing something the dominant bunny does not like. As you are the prevailing animal in the relationship with your bunny, you cannot nip him/her when they are doing wrong, but a loud "NO" followed by a sharp clap of the hands will communicate the same displeasure as a nip. A rabbit will "mark" its territory by rubbing their chin on items. This is called "chinning". When you have a pair of rabbits, you may also witness one rabbit rubbing its chin on the other to "mark" its companion as theirs. You can demonstrate this same technique by rubbing your face against your rabbits head and allowing bunny to rub their chin against yours. To avoid startling your bunny when you enter the room, start talking to him/her as you approach the room. Your bunny knows your voice and will then know that you are approaching. It is also a good idea to talk to your bunny before you pick them up off the floor. If your bunny is not aware that you are present, and you reach down to pick them up, they may think they are being grabbed by a bird of prey! Is there a right way to pick up and lift your bunny? Yes! 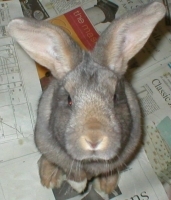 The first thing to be aware of is that your rabbits ears are the most sensitive areas on your bunny, so do not pick up your furry friend by their ears. I would not suggest picking them up by the scruff of the neck either though there are people that say you could do this as long as you do it quickly. Your rabbit also has very powerful hind legs, yet very little bone mass in their spines according Duke University. If your bunny's legs are left free and hanging while you pick him/her up, they could, and will, kick hard to try to get back to the ground. This is a natural instinct. Prey animals often grab wild rabbits by the back or neck. The only defense a rabbit has against predators is their powerful legs. They will kick not only in the hopes of catching the predator with their hind claws, but also in the hopes of breaking the grip of the predator and getting back to the ground. However, a powerful kick with the hind legs could cause problems such as dislocated hips, pinched nerves in the spine, and in some cases, permanent hind leg paralysis. When removing your bunny from the cage, put your hand around the back of the bunny to get him/her to move to the front of the cage. Place one hand under the hind quarters supporting the back legs and the other hand under the front legs and chest. Remove your bunny quickly pulling the rabbits hind legs against your body. 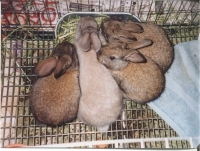 Each rabbit will have their own position where they feel safe and secure while being held. Some bunnies prefer being held upright like a baby with their head at your shoulder, some rabbits can be held with their hind legs on your forearm and front legs on your hand. Some bunnies just don't like being so high above the ground at all. If your furry friend is nervous being in your arms, you can tuck his/her head between your arm and side, or cover the head with a cloth so that they think they are hiding. 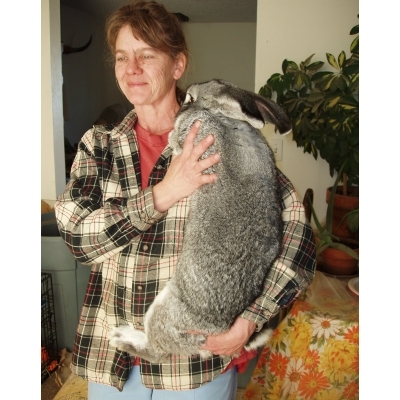 Do not persist in holding a rabbit that continues to fight and struggle while in your arms as they could damage their spine. Never drop a rabbit when putting him/her down. Bend over and place all four feet on the ground. The most important thing to remember is always support the hind legs to prevent spinal or hip damage.